A fire burns at Newly Weds Foods in Chicago’s Hermosa neighborhood. A massive fire broke out at a food factory in the Hermosa neighborhood of Chicago. 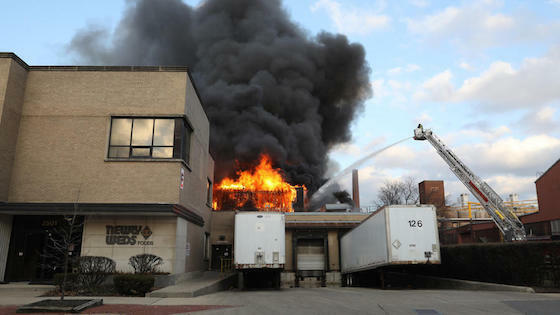 The 5-alarm fire broke out April 2 around 5 p.m. at a processed food factory in the Hermosa neighborhood on the Northwest Side, said officials at the Chicago Fire Department. As a result of the fire, which burned for about five hours, it halted Metra trains during evening rush hour, officials said. Milwaukee District North trains resumed later Tuesday after being halted in both directions. Just before 5 p.m., firefighters responded to the blaze at Newly Weds Foods, 4125 W. Wrightwood Ave., according to a tweet from Chicago Fire Department spokesman Larry Langford. No one was injured in the fire, as employees evacuated the sprawling property when the blaze was detected and all were later accounted for, fire officials said. A hazardous material incident was declared for the area, Langford said. The building collapsed about an hour after the fire broke out.